The Meridian Market Theory - is a long-term (monthly) trend line of the S&P 500 that is comprised of a 'Who's Who' list of memorable market moments and pivots of the last 25 years. Now before I get ahead of myself, I am not your father's technician - I use TA as a guide primarily for resistance and support and listen to the tape when it's trending in between. From the perspective that the trend line has intersected so many crucial moments in recent market history gives this chart more weight than others - and I'm sure the machines are watching it closely as we have tested and was rejected by it. In fact it delineated the recent market highs in February so precisely that it will embolden the bears to press the downside in the near term. 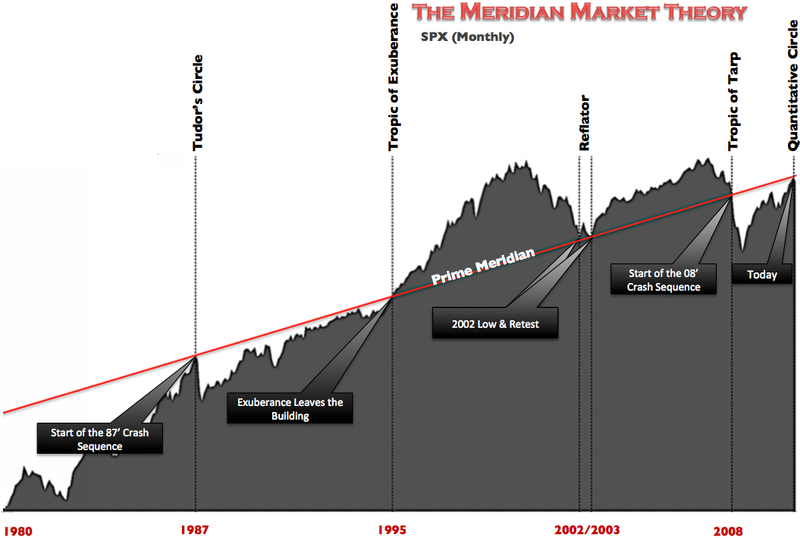 I suppose the bulls could argue that the Prime Meridian - as it stands today, marks the threshold where the reflation story either finds another gear and gains legitimacy within the market zeitgeist - or just becomes the upper limits of the market trend as it did back in the early 1990's. With that said, and with a variety of conditions satisfied – both technically and sentiment wise – I am cautiously running with the bulls here and taking notes along the way.